Italian baroque composer, Domenico Scarlatti (1685-1757), is well known to keyboard players for his sonatas. 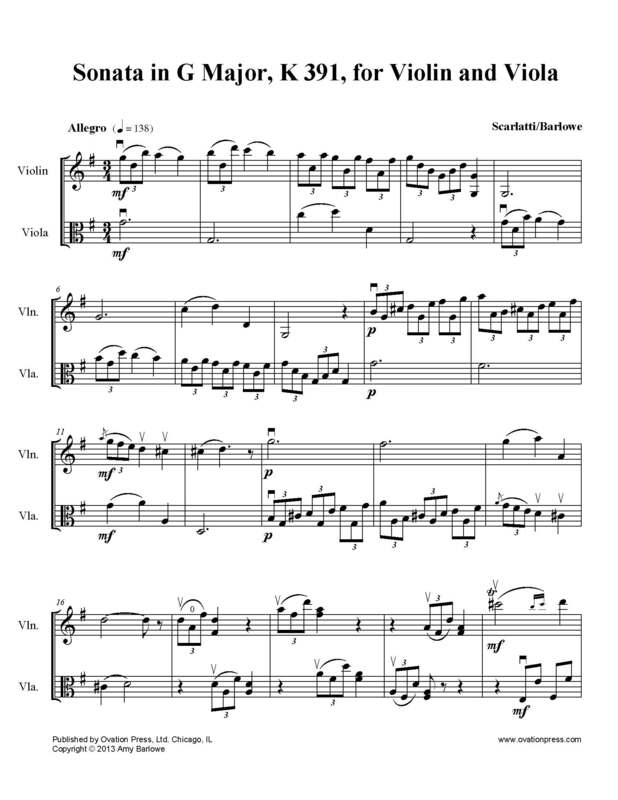 Written primarily for harpsichord and most often in binary form, they number close to 600. The elegant Sonata in G Major, K. 391, is particularly well suited to the violin and viola because of its linear contrapuntal texture. As a duo, the parts are well balanced, encouraging lively conversations between the two instruments throughout the work. Since the harpsichord could not easily produce dynamics, and because baroque musicians were noted for their adept spontaneity, literature of this period is often devoid of markings. Those to be found in this duo are merely suggestions. Performing the sonata with dance-like energy, lightness, and sparkle will imbue it with characteristic charm.